Gerald Anderson loses his first Ironman race due to a penalty. 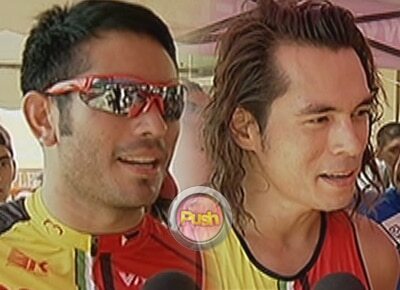 In Gretchen Fullido’s report on TV Patrol, actors Gerald Anderson and Jake Cuenca shared their enthusiasm about joining the Ironman 70.3 Triathlon in Subic, Zambales. According to the rules of the event, athletes must remain outside the draft zone (6 bike lengths between bikes) except when passing. Failure to do so will result in a drafting violation; (5:00 Minute Time Penalty). Gerald is now on his way to the USA to compete in the LA Marathon while Jake will continue his training for his next Ironman race in Cebu.